Evgeni Malkin has spent his career being underrated while in Sidney Crosby's shadow, but how has he historically played without the Penguins' star in the lineup? When it comes to how Evgeni Malkin is perceived, there's an apparent anchoring bias that hampers his reputation. It's difficult for Malkin to be evaluated on his own plane because everything he does will be compared and contrasted to teammate Sidney Crosby, who happens to be one of the greatest players of all time. But for as long as Malkin has been a Penguin, so has Crosby, and despite perennially being a top player on the planet, Malkin has been overlooked. He was omitted from the NHL's list of 100 greatest players, nothing more than a novelty, but another signpost of Malkin being dismissed. Since entering the NHL in 2006, Malkin leads all skaters in points per-game, and is fourth in scoring behind Crosby, Alex Ovechkin, and Joe Thornton. His resume is Hall of Fame worthy, but when it's held up to Crosby's (which it perpetually is) it's tough to evaluate or appreciate it as its own entity. And that bias has hurt Malkin's reputation. But now, in the middle of a second-round series against the Washington Capitals, and without Crosby—out with a concussion—Malkin finds himself in a familiar spot, and one that, even by his own standards, he's thrived in. Crosby and Malkin have been Penguins teammates for 868 regular season games, and, of those games, Crosby has missed 168, over two full regular seasons. Of those 168, Malkin has been in the lineup for 115 of them, or over 16% of Malkin's Penguin career. It's rare that even when both players are in the lineup they skate together at even-strength. This season, 10 different Penguin forwards were on the ice at 5-on-5 with Malkin for more time than Crosby, according to Stats.HockeyAnalysis.com. Since 2007, Crosby has been one of Malkin's two most common linemates once. And that actually makes Malkin's increased production without Crosby in the lineup even more curious. With the Penguins two top forwards staggered, the opposition has to choose whom to deploy its top-pairing defensemen against. But if that's Crosby on most nights, then Malkin is getting watered-down competition, option 'B'. Except take Crosby out of the equation, and that leaves Malkin to hone in on. Yet in large samples without Crosby, Malkin's production actually goes up. There's a lot to unpack here, but the overall theme is Malkin's numbers see an uptick despite decreased ice time. His power play goal scoring remains the same (he and Crosby have often played on the same power play unit), but his overall goals are way up. The decreased ice time is also interesting. Crosby was injured right at the beginning of Game 3, during his third shift, and Malkin went on to log 21:58 in a game that went to overtime. It was his third-highest time on ice total of this postseason, behind two first-round games against the Blue Jackets that only required 60 minutes. In Game 4 of the series, Malkin skated 20:12, second among Penguin forwards and fourth among Pittsburgh's skaters. Without Crosby, the Penguins are on the brink of advancing to their second straight Eastern Conference Final, and third in five seasons. In two games without Crosby, Malkin has a goal and two assists, and has shown just how much of a force he is. Here, Malkin gets tossed out of the faceoff circle and lines up on the right hash. He gets lost a bit along the boards, but, his one-timer is blocked and kicked back to him. The Capitals though are not going to give Malkin another free look like that, and when he gets the puck back, both forwards collapse to his side. 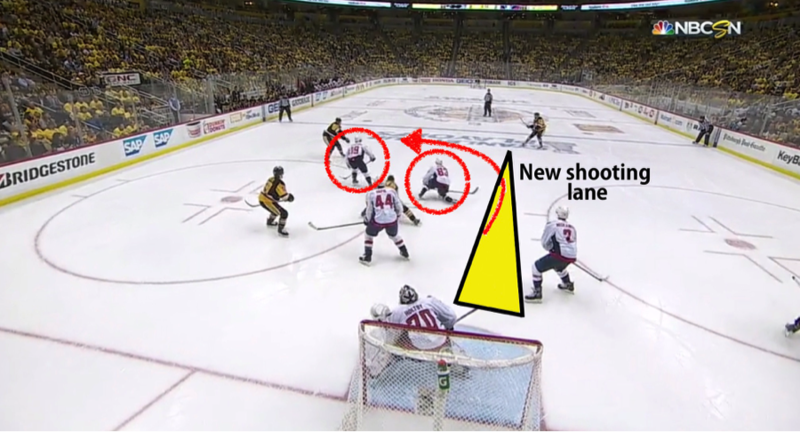 The problem is though, while Malkin patiently stickhandles the puck, drawing Washington in closer and closer, he's opening up more angles and other lanes. Jay Beagle goes down on one knee, essentially gluing him to his spot, and Justin Schultz creeps down from the point and walks into a one-timer. 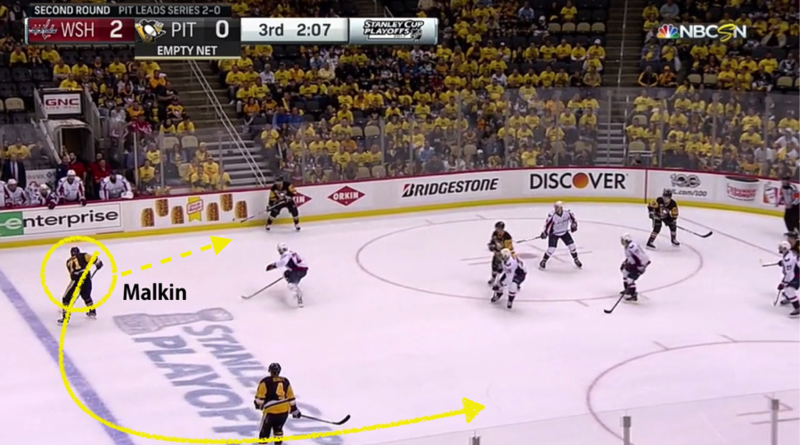 Malkin changes the geometry of this play with each stickhandle. 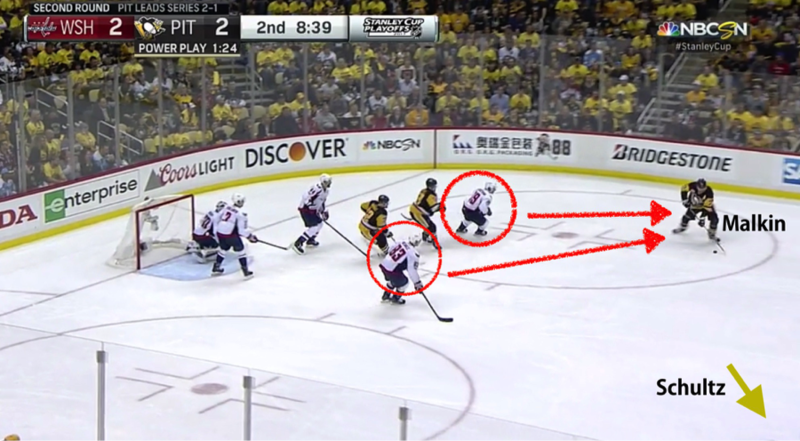 Because of how wide he is, even when Washington collapses, he's not trapped or without a lane to move the puck. This is what star players do: They attract the attention of the opposing team, and change the way the ice is spaced. At other times though, star players need to go undetected. This is a different skill, but one that is necessary. 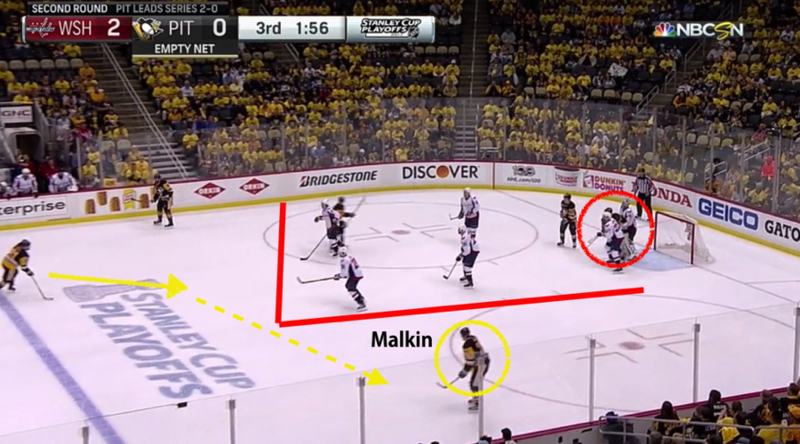 Though he scores from the right circle, Malkin starts out on the left point. After he gives up the puck to a teammate, he slowly begins to make his way across the blue line and down to where he'll eventually get the puck. What Pittsburgh does so well here is, while Malkin is floating into a scoring position, the Penguins move the puck into the teeth of the Capitals defense, forcing them to be active. Phil Kessel threads a pass to Chris Kunitz, and Justin Schultz skates through the area above the crease. Washington has to press Kunitz because of where he is, and Schultz is creating more traffic by cutting across the zone. Finally, Malkin's circumnavigation of the zone is finished, and the Capitals have shaded toward the other side of the ice. Kessel can skate into the space below the blue line, freeing up a few more seconds for Malkin, before delivering a pass for the one-timer. 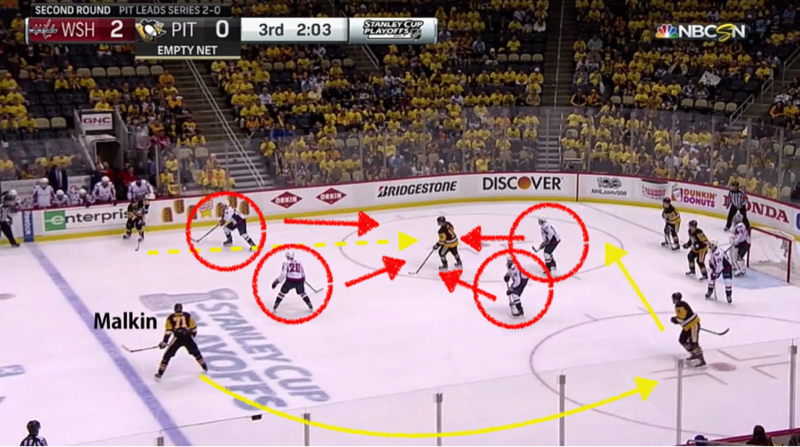 These are the sequences that get defensively criticized after the fact—'how did Washington leave Malkin so open? '—but it's tough to apply pressure on a player who slowly skates across the blue line while his teammates are cycling the puck in the zone. Crosby skated on Thursday, and Pittsburgh coach Mike Sullivan said he's day-to-day, his status for Game 5 on Friday to be determined. The Penguins, looking to be the first repeat Stanley Cup champions since the Red Wings in the late 90's, will be in a much better position to do so if they can get their captain back healthy, and on the ice. But without the services of Crosby, Pittsburgh has another all-world center it can lean on, and one who has proven he can carry the load without the kid named Sid.